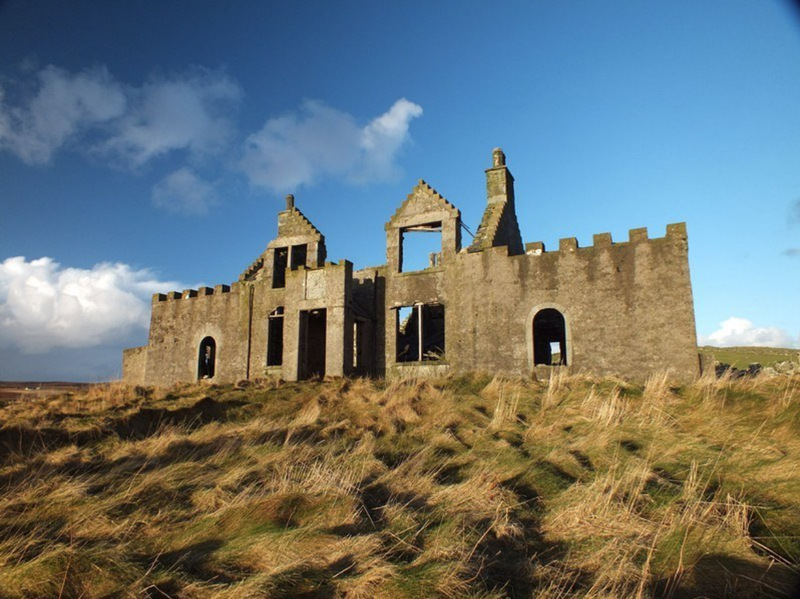 THE MYSTERIOUS ruin of a former laird’s house on the Shetland island of Yell is back on the market after an earlier attempt at restoration came to nought. Windhouse, near Mid Yell and overlooking the head of Whalefirth Voe, is reputed to be the most haunted house in Shetland. The original name of the house was ‘Windås’ meaning built on a windy rocky ridge. Twelve years ago the bird charity RSPB sold the building to a couple from Cheshire who fell in love with the place and planned to renovate the castellated house. Ghostly inhabitants include a lady dressed in silk who is believed to be the spirit of a woman whose skeleton was found under floorboards of the main stairs. There is also a servant girl who mounts invisible steps and a ghost dog. Local historian Neil Anderson dismissed the story of the haunted woman walking on the stairs as a “ghostly apparition” coming out of people’s imagination. However, as far as he is concerned there is indeed evidence of skeletons found in the property. “The only two skeletons I have heard about are that of a child behind the lining of the wall in the house, and the skeleton of a man under the back doorstep. “As far as I gather he was a workman. There had been draining carried out at the farm nearby; they had a party after the end of the job and this guy got killed and they put him under the doorstep. Anderson said he felt nothing untoward when he spent a night in the house back in the 1980s. At that time the house was in much better shape with the second floor still intact and most of the roof in place. “I certainly heard nothing the night I stayed there except starlings flying in and out of the building and annoying me, and the dogs barking at Setter. “People always said ‘Oh, no! Nobody can spend a night in Windhus’. I just wanted to do it,” he said. The last family to live in the house left in the 1930, apparently after lightning struck and killed some sheep. Estate agent Dowle, Smith & Rutherford said the C-listed ruin required “complete restoration but nonetheless represents an exciting conservation project”. Outline planning permission for restoration was granted by Shetland Islands Council in 2001. This has now lapsed although some preparatory work to secure permission for a distinctive four-bedroom property had been carried out. The asking price is for offers above £25,000 and prospective purchasers are advised not to enter the site because of the building’s extremely dangerous condition.